............."OH MY GOSH!!! This thing is fantastic. It is incredible how easy and quick it works!!" 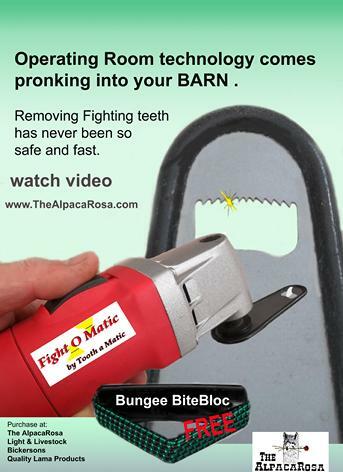 would trim the alpaca/llamas fighting teeth as easily and safely as the Tooth-a-Matic has been trimming the incisor teeth. ........."Don, now if you figure out how to make a mini tooth a matic for fighting teeth, I promise I will be first in line to purchase!" The Fight-O-Matic cuts each tooth in 1-4 seconds(depending on thickness of the tooth). 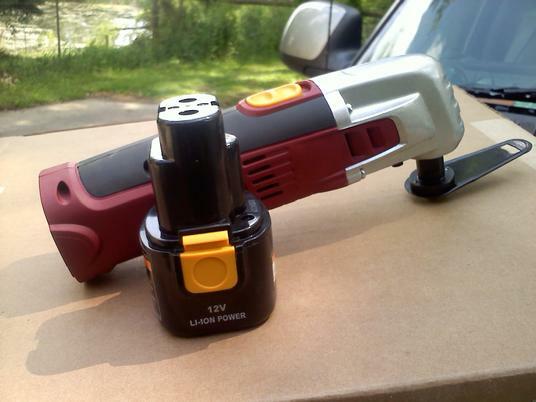 May 2012, Now available in cordless! As of this writing (Sept 1,2009) the prototype has been proven successful. I removed all 6 of 24K Gold's fighting teeth. "Wow!, slicker than owl sh*t"
As of Jan 1, 2010, We have manufactured 200 units and they are now currently available for sale in our farm store. As of May 1, 2012 we have sold 200 Fight O Matics worldwide. We now have introduced the Fight O Cordless. While I was working on this project, I decided to tidy up a little detail that would simplify holding the alpaca's mouth open while performing my dentistry skills. 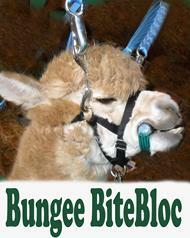 So I designed the Bungee BiteBloc. This REALLY worked out great! which aids the breeder in ONE-Person operation of the Fight O Matic and Tooth a Matic. x Fight O Matic Instructions are posted on this site here Instructions . The Fight O Matic was well concieved with It's mobile-friendly 12' cord and convienent "hands-free" Bungee BiteBloc®. But, combined with a Patent pending Fight O Tip design and safety rubberized edging , The Fight O Matic is one of the most innovative tools that has touched the livestock dentistry field in years. At 12,000-21,000 oscillations per minute smooth and quiet motor, permits speedy trimming of alpaca fighting teeth. I searched near and far for a smooth operating tool with minimal noise. This has the lowest decibel rating on the market. Simply place the tooth through the Fight O Matic cutting tip hole, turn on the tool, pull the tool tip toward you and in less than 2-5 seconds POP! , No more fighting tooth! Not until I came up with the innovative design of saw teeth inside of a hole, could I envision a safe method of cutting alpaca teeth, using oscillating technology. There is absolutely no way to accidently cut anything with the Fight O Tip. Even if you were to stick your tongue through the hole, the saw blade would merely move your tongue back and forth and NOT cut it. The Fight O Matic cannot cut soft tissue , only hard bone. I demonstrate this in my video! So remember, The cutting edge is completely encapsulated inside steel with a protective edging. So safe, I dared to tickle my own tongue with the Fight O Matic! ........"If oscillating technology is good enough to cut human bone and cut-off casts, it's certainly safe enough for cutting alpaca fighting teeth"